Welcome back to the pitching strikeout rate risers and fallers article series! Each week, we will take a look at two K% risers and two fallers among pitchers, analyze what is behind those changes, and then decide if they are actionable. 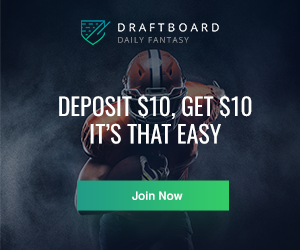 This exercise is particularly useful for fantasy players because K% holds direct fantasy value in both points and categories leagues. Understanding strikeout trends can help you take advantage of buy-low or sell-high candidates that your competition may have missed. Last week, we compared starting pitchers’ 2018 K% to their current K%. Given the early age of the season and small sample sizes, this week we will do the same thing but for relievers. 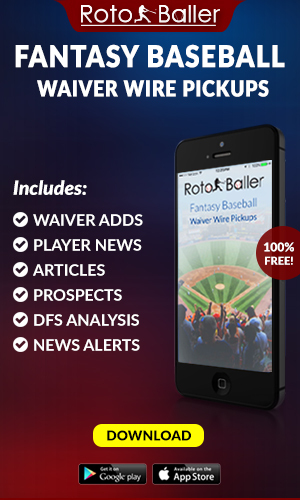 We will use RotoBaller's K-Rate Risers and Fallers premium Tool for later editions of this article. A quick caveat related to the young season; it is sometimes difficult to draw meaningful conclusions from small sets of data, as they may not be representative of a player’s true performance overall. That being said, let’s get into our relievers K% Risers and Fallers! Identifying top strikeout rate risers and fallers for each week can help you spot the best pickups before your competition. 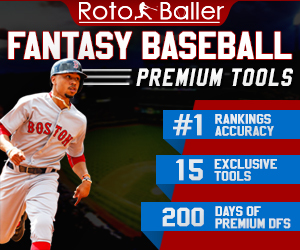 RotoBaller's Premium K-Rate Risers and Fallers tool has you covered every day. As thoughtful fantasy baseball players, we won't lead you astray. This tool will soon be active once we have a large enough sample size in the season to be considered reliable. This type of data is available as part of our Premium MLB Subscription. Don't settle for basic stats and surface-level advice from other sites. 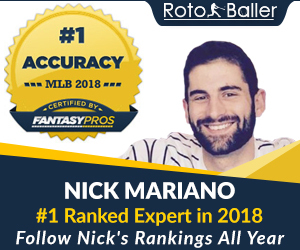 RotoBaller brings you advanced statistics and professional analysis that you need to win your fantasy leagues and DFS games, because we're ballers just like you. We are your secret weapon! Our first riser made a solid showing in his first Major-league stint in 2018 and seems to be carrying things over to 2019. Ty Buttrey did well in his 16 ⅓ innings of work in 2018, posting a 3.31 ERA with 20 strikeouts and four saves. While he is not currently closing for the Angels, he has gotten off to a superb start to this season; Buttrey has not allowed an earned run yet and has an impressive nine strikeouts over six IP. 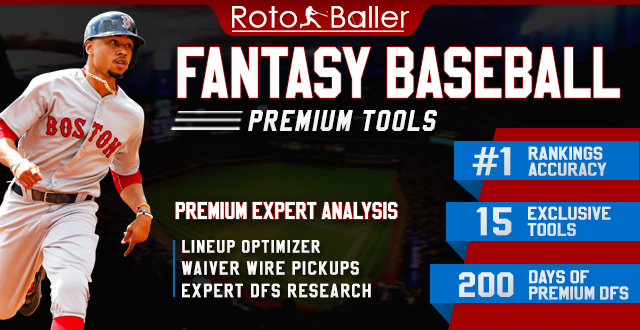 Is Buttrey someone that could help your fantasy team in 2019 and beyond? Buttrey has the makings of a strikeout reliever. His fastball sits at around 96 MPH and he is also able to generate strikeouts with his slider (four of his nine strikeouts have come from the slider). His arsenal helps him avoid contact from hitters; Buttrey’s swinging-strike rate 18.5% is currently 10th-highest among relievers and his 63% contact rate is 12th-lowest. Additionally, the 26-year-old has strong command (0.83 WHIP), so he provides more value than just strikeouts for fantasy players. Overall, Buttrey is an interesting fantasy reliever with considerable upside. He isn’t a closer right now but has been used mostly as a setup man for Cody Allen, so he presumably would see save opportunities if Allen would falter. Regardless, Buttrey could help fantasy players in categories leagues in at least three of five categories. Our second riser showed the makings of an elite reliever in 2018 and has picked up right where he left off. 22-year-old Jordan Hicks posted a 3.59 ERA with 70 strikeouts and six saves in 77 ⅔ IP in 2018 and has improved so far in 2019. His 2.57 ERA is lower, he has continued to see save opportunities (converting three of four chances), and has eight strikeouts in seven IP. Is now the time to go all-in for Hicks? The main reason Hicks has been so promising is the great stuff he has to work with. He has a 100-MPH sinker and an 86-MPH slider which he can keep down in the zone (his average launch angle is a solid 6.5 degrees). His velocity has been there out of the gate and he has gotten batters to miss more on his thrown strikes (36.6% whiff rate vs 24.4% in 2018) and on his pitches in general (16.7% swinging-strike rate vs 9.4% in 2018). Consequently, batters have made less contact overall against Hicks (63.4% vs 76.9% in 2018). There isn’t much more that needs to be said about Hicks. He’s a young flamethrower who could be a huge fantasy factor this season, especially if he continues to see save opportunities. His lone blemish is his proclivity for walks (he has a 3.86 BB/9 rate in his young career), but fantasy owners will overlook that with everything else he can provide. Hicks looks like the real deal and should be owned everywhere. Our first faller broke out in the fantasy world last season by taking over as the Rangers closer. Jose Leclerc looked like an exciting fantasy option after his 2018 performance; the now 25-year-old had the seventh-highest K% among relievers with 12 saves. Things don’t look quite as good for Leclerc so far in 2019; he has a massive 6.00 ERA and six strikeouts in six IP. Should fantasy owners be concerned that last season was just a fluke? First, Leclerc’s overall numbers are misleading due to the small sample size. He has pitched six decent outings and had one rough outing in which he gave up three runs in just a third of an inning against the Diamondbacks. That one outing has a much greater effect on his averages now; every pitcher has a few bad outings over the course of the season, but they get overshadowed by the greater number of solid performances. Leclerc is securely the Rangers closer, so fantasy owners don’t need to worry about his early performance overall. Digging into his strikeout numbers, nothing alarming stands out for Leclerc. In fact, the velocity and spin rate on his two main pitches, the fastball and slider, are actually up in 2019. He has good velocity for his fastball and great movement on both pitches, so the arsenal is definitely still there. Further, his 2019 swinging-strike rate (4.9%) and contact rate (87.5%) are significantly off from his career totals (15.5% and 64.8%, respectively). I expect regression back towards his career numbers over the course of the season. Overall, no one should be concerned about Leclerc. He has all the tools he needs to be successful and has merely been a victim of a small sample size. Fantasy owners will be rewarded if they stay patient. This faller was surprisingly useful in deep fantasy leagues last season, particularly in holds leagues. Richard Rodriguez was a solid bullpen piece for the Pirates in 2018, generating 88 strikeouts with 15 holds and a 2.47 ERA in 69 ⅓ IP. He does have two holds in 2019, but also has a 6.75 ERA and just six strikeouts in 6 ⅔ IP. So will Rodriguez provide any fantasy value for the rest of the season? A few things stand out after diving into Rodriguez’s numbers. Rodriguez throws a fastball and a slider, and his velocity is similar on both compared to 2018 (92.5 average MPH vs 92.9 MPH in 2018 for the fastball, 80.6 average MPH vs 80.9 MPH in 2018 for the slider). His spin rates are actually up for both pitches (2,473 revolutions per minute vs 2,374 in 2018 for the fastball, 2,323 revolutions per minute vs 2,151 in 2018 for the slider), so he should be getting more movement than last season. His contact rate is up (79.1% vs 71.8% in 2018) but his swinging-strike rate is similar (10.5% vs 13.8% in 2018). In sum, there is nothing alarming about Rodriguez’s stats compared to 2018 yet. Given his underlying numbers, there is no reason to think that he will not perform at the same level given a larger sample size. He should continue to provide stability to fantasy owners’ numbers in deep categories leagues. All stats current as of Sunday, April 14. Engel's Angles - Sell High on Clint Frazier?